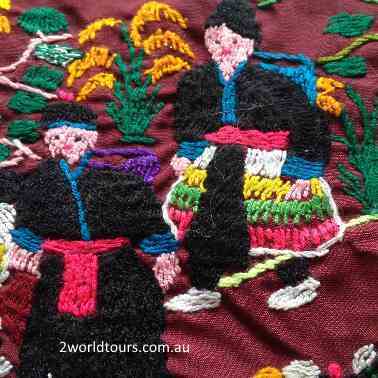 If you've ever experienced the vibrant nightly craft markets of Luang Prabang in recent years you will no doubt have seen lots of examples of Lao 'story cloths'. I recently came across a few story cloths that I collected on my first visit to Laos and decided to find out more about them. 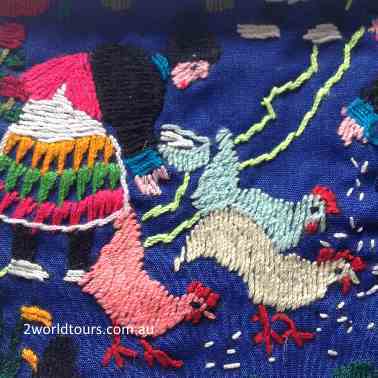 In those days they were just selling the pieces of cloth - but over the years they've begun incorporated them into quilts, bags and cushion covers to cater for the tourist market. 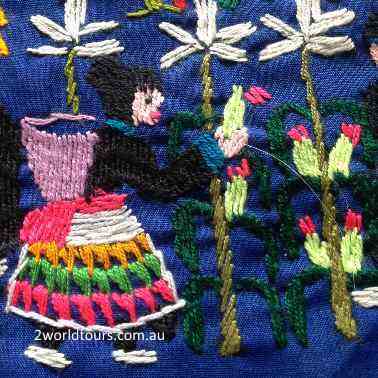 Research suggests that the story cloths came about when the Hmong who fled the conflict in Laos during the 1970's, streamed into refugee camps in Thailand and began making embroidered pictures or images. There are a couple of the theories as to why the story cloths were created. One theory was that as the Hmong in the camps became increasingly in touch with books, including illustrated English language, the aid agencies used these books as a way of encouraging literacy through sewing (The embroidering of English words on some cloths backs this up). Its also said that the aid agencies then encouraged the women (and men) to create the story cloths as a product which they could sell. Ive also read some accounts of the men being taught by missionaries in the 1960's how to draw daily life which they in turn gave to the women to embroider but when they settled in the refugee camps the men also started to embroider their drawings as a way to make an income. Another way of looking at it is that it really was history repeating itself in that when the Hmong were fleeing the Chinese hundreds of years previously and began using embroidery to hide their script and symbols - these story cloths were a new way of expressing and recording the Hmong history and culture. 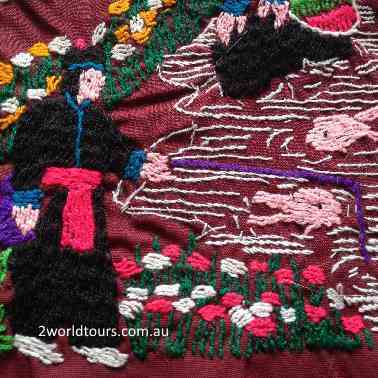 As opposed to the decorative style of other Hmong embroidery, using cross stitch and long stitch to create stylized motifs and symbols, story cloths use a large amount of surface embroidery to depict characters and landscapes. Some story cloths depict stories of war and conflict but many also depict traditional village life and cultural celebrations like New years. On my search I've found thousands of examples of the story cloths - from simple pieces depicting child like characters involved in daily life to highly elaborate works with thousands of figures and words telling several stories in one cloth.